There are many Young Muslims facing problems in regard to their future paths. It is especially difficult for those in homes where parents are foreigners, due to a lack of understanding about the educational system of Japan. There are children that do not receive adequate support, fail in making a wise decision of which high school to go into, resulting in them dropping out of school. 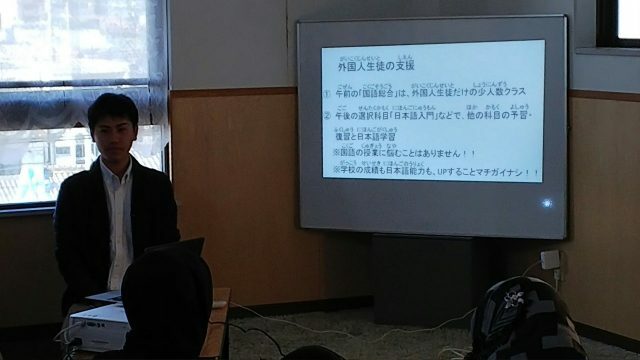 With support from Aichi prefectural government Tabunka-kyosei Suishin-shitsu, we organized a consultation event for foreigners. Below is a brief summary of the event. ・In Japan, it is obliged that parents grant their children education. Parents with foreign nationals must also see this as an obligation. ・ High school opens gates to further education and career paths. Graduating high school will widen future possibilities.（(Graphs were shown indicating that, there are 140 times more job offers for those with high school diplomas compared for those with only middle school diplomas, and that salary for full-time employees is 2 times more than the salary given to part-time employees. ・Other than the ordinary full-time high schools, there are alternative part-time high schools which offer classes during the afternoon. Students can graduate in 3~6 years, and are allowed to work part-time whilst they study. Many, after graduation, proceed into university. ・The current reality of the Japanese job market is that, many with high school diplomas work in factories, whereas many of those with college degrees work in specialized and technical jobs. ・ Shirokita-Tsubasa high school is a credit-based part-time high school. Students can graduate in 4 years by taking 4 hours of classes in the morning. If students choose to participate in “Selective Afternoon Class”, students can graduate in 3 years. 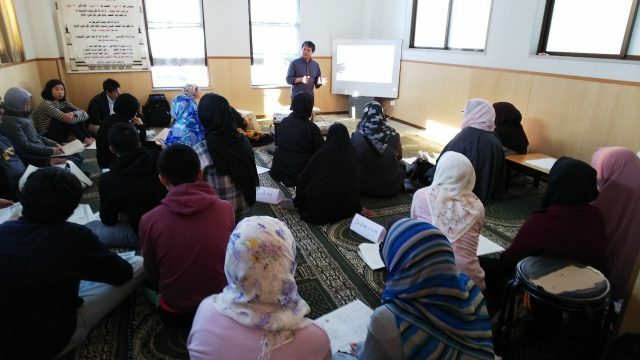 Basic subject classes for students having difficulty in studying, and classes that teach subjects actually implementable in society and homes is also offered in the “Selective Afternoon Class”. ・ Foreigner students are offered special support, and hence can aim for good grades and improved Japanese abilities. For example, “Comprehensive Japanese” is a class offered in the morning only for foreigner students. “Introductory Japanese” is a class in the afternoon, where students can prepare and review materials from different classes and also study the Japanese language. ・An introduction of Shirokita-Tsubasa high school was given (many pictures were shown of school facilities, classes, school events, and extra-curricular activities). 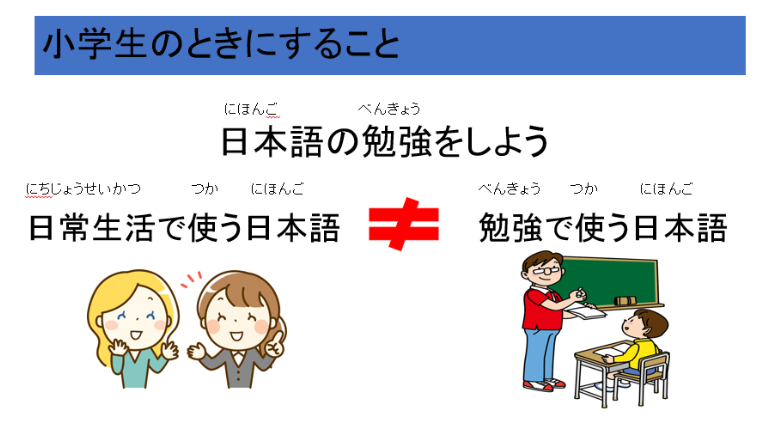 ・ Japanese used in daily life is not the same as Japanese used for studying. It is therefore important to learn Japanese. ・What to do whilst in elementary school: Don’t be absent or late for school. Do homework every day. Japanese used in studying can be learned in Japanese language schools, and so parents should search for such institutions for their children. ・ What to do whilst in middle school: Parents and children should know the high school system of Japan, and think about future paths after graduation together. All talks were translated in to English, Indonesian, and Pashtu for the participants. Young Muslims already in high school and university also shared their experiences. May this event help in making children’s future bright, and prevent them from having to give up on entering into high school and also dropping out after admission. 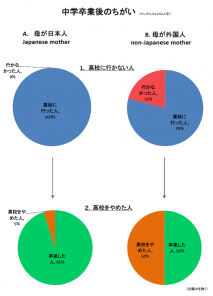 ※ It is important to understand that even though children may be speaking Japanese fluently, it does not mean they have the Japanese needed for studying in school. For information on Japanese language schools near you, contact Multicultural Center below. In Aichi International Plaza, 2-6-1, Sannomaru, Naka-ku, Nagoya.